Accidents are unfortunately bound to happen in life, so it is best to be prepared, especially if you are in a country that is new to you. This article describes a French hospital experience, and offers advice on what steps you can take to be totally organised with regard to your health care in France. It had been a perfect Languedoc morning, crisp enough to befit the season yet boasting, as it so often does, a sky of purest blue set off by the rich golden sun of winter. My friend and I had ridden out on the horses into the foothills of the Pyrénées, never breaking out of a walk, content just to enjoy the sight of the snow-topped peaks of the mountains and to smell the heady scents of pine trees and wild lavender crushed under the horses' hooves. Horses and deers - not a good combination! We were relaxed, chatting, and totally unprepared for the events that followed. I had almost dropped the reins to let my horse stretch her neck, so had no chance of taking swift control when a deer shot out of the pine forest to my right, panicking both horses into a bolt. It happened so swiftly, I didn't have time to be frightened, but when I saw the thick undergrowth ahead I was struck by the certainty that I was not likely to be staying in the saddle for much longer. 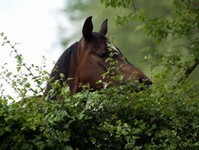 My mare dived into the bushes and swerved abruptly to the right. Anticipating the swerve, with unerring accuracy I swerved to... wait for it… the LEFT… and crashed heavily to the ground, as the horse continued her headlong rush out of the bushes and away across the hills. Once I recovered the ability to breathe, I became all too aware that my left shoulder and ribs had sustained some damage, although fortunately I was still able to help Clare (whom was nursing a bruised derriere!) to catch the horses and lead them home. Having seen to the horses I felt entitled to give in to my own pain, so called my husband who obligingly drove me to the local hospital. (Had I been unable to walk home Clare would have called the Pompiers, who are apparently equivalent to several accident services in France, providing rapid response for medical emergencies, injuries, and road accidents, as well as fires.) Our town, Castelnaudary, is a reasonably large town, and possesses its own hospital. The Accident and Emergency Department is open until 9pm, so as long as you have the good sense to indulge in accidents before this hour, you have no need to go further afield. I made the point, but my French was corrected before I was taken to see a nurse. (Apparently the correct term is 'Chute de cheval'… oh well, I shall know for next time!) The treatment I received from then on was exemplary. First a nurse, who took essential notes on blood pressure, heart rate, allergies, etc, then it was off to 'Radio' for the most thorough X-ray session I have ever experienced. Some 25 X-rays later, I was returned to the care of the nurse, who then summoned a doctor, who spoke just enough English to explain the treatment he was prescribing. Armed with a prescription for more pills than I thought it possible for one person to consume (pain relief, anti inflammatory, muscle relaxants etc!) as well as immediate pain relief, we were told to return for the X-rays in the morning, when they would be ready for collection. This is a major difference between the British medical system and the French. 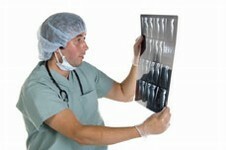 In France, you are responsible for holding your own medical records, so X-Rays and notes are all given to you to keep. (This also applies to Vets!) It does mean that you must set up a decent system for storing records, but on the whole the system works well. In France, health care is not totally paid for by the state. Assuming you are in the French system, that is employed or otherwise paying your contributions, you will be issued with a Carte Vitale, which entitles you to part payment (70%) of all medical bills. The remaining amount is either paid by yourself, or by a 'top up 'policy which most people take out, frequently through a professional association or private assurance company. If you do not have a Carte Vitale, either because you do not reside full-time in France or because you have not yet become fully integrated into the system, there are a few options open to you. If you are still resident in the UK, but are visiting France for a maximum of 180 days, the European Health Insurance Card (EHIC) will provide you with cover. If you are still working in the UK and paying National Insurance Contributions, the EHIC will be valid if you visit France for up to six months in any one year. (Any British Post Office can inform you about this.) Bear in mind that with the EHIC, EU regulations specify that state-run hospitals or medical centres only must be used in order to qualify for help with the cost of treatment. It is also possible that should you have paid your National Insurance contributions in the UK over the years preceding your departure to France and are taking early retirement, you could be issued with an E106 form, which you register with your local Health Care office. This is valid for up to two years and allows you to access the French Health care system and to claim the costs back through the UK National Health Scheme. Details of this and other possibilities according to your personal situation, can be obtained from the Pensions Office in Newcastle. You may of course also have taken out private accident insurance. Whatever system you are using, you must be prepared to pay the bill up front and claim back the money later. Whatever is most appropriate for you, it is advisable to address the problem before you have need of the service, or costs can mount alarmingly. The care you will receive is excellent, but you may find yourself needing deep pockets if you don't address the task of organising your health care before you require it! UK residents are often a little lazy about this, used as we are to 'free' health care (although we all know it is really just another charge on our tax bills!). A week later and I am healing slowly (thanks for asking). I am the proud possessor of lots of X-rays that can be trotted out at dinner parties to impress the guests, which is a distinct advantage over the system in the UK, where the hospital holds the X-Rays! I am taking very effective pain relief tablets, for which I am eternally grateful, and I am awaiting reimbursement of the 180 Euros I paid for the privilege. I have no complaints…although I shall not be rushing to repeat the experience! Just a wee warning but it will save endless angst if the worse happens and your spouse dies. My husband died of a heart attack just 16 months after we bought our cottage in the Limousin. I had all the emergency numbers on the telephone - except the English speaking service (112). I do not yet have good French and spent 15 minutes desperately trying to make sense of the automated messages for ambulance, fire engine, emergency Doctor. In this case having the number would not have saved his life but in other circumstances it could have done. In retrospect I would have 112 in large figures on the wall, along with my telephone number and address. Believe me, at such a time, it can all disappear. I would also like to say how immediately supportive our neighbours and friends in the village were. I guess that underlines the adage "integration integration integration" that is always stressed in advice to newcomers to France.